I must apologise to followers of my other blogs: I did not forewarn them that my fickleness has prevailed once again, so I am down-sizing my number of blogs. As much as I love blogging about fashion and style of almost all decades, my true passion/obsession is really the 40s, so I am going to re-commit my focus on "Letters from the Home-front." This may also help me free up time for tackling life on the real home-front, which has been quite action packed. You see, life as a Land Girl is about more than just dressing up and getting pretty for vintage photoshoots. There are hidden foes to be quashed at every corner. 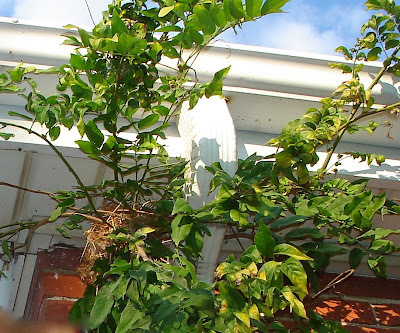 My first opponent: a mutant Wisteria that was growing up the side of the house and infiltrating the roof; I single-handedly destroyed this fiendish foliage while dangling precariously from a sky-high ladder. Next, I had to mercilessly evict a mountaineering house-mouse who had built his nest in a nook created by the bend in the drainpipe, just below the eavestrough of the roof. We've been calling him Dracu-Mouse because when we disturbed the nest, he scaled down the wall, head first, like the creepy Gary Oldman Dracula in the Coppola film. Have just watched a week long series entitled Land Girls on BBC TV over here in England - really enjoyed it. I was sitting here quietly drinking my hot tea, reading your post regarding rogue wistera and mice, when I scrolled down and saw the MONSTROSITY of a bedroom that had Spider Man all over it! I almost snarfed my tea! I was NOT expecting that room. Good luck with that. I want pictures when you are done. Oh goodluck Landgirl, we will wait with baited breath for the next installment. Spider Man HAS to go!! Spider man does have to go - i agree with Dustjacket! Good Luck!!! Spidey is going to be a tough challenge... oh and you might just get to a third coat!!! Dum Dum DUM!!!!! I have removed many a vinal wall papered room, peel the vinal sheet off leaving the paper backing. take a spray bottle and water spray the paper let it soak and scrape clean with a putty knife or metal spatula. wash surface when through with household cleaner and you are ready to prime for new paper or paint. this is the easiest way a steamer is too much trouble. thanks for the "good luck" wishes .... and thanks for the tips, Jeanne!! I'm not sure when I'm going to banish Spidey (I'm procrastinating on this), but after I do, I will be sure to post "after" pics. Thank you very ,such for all of your wonderful comments, I hope that everything turns out all right with the new place! Haha, you are so funny. Loved reading this. You have some work cut out for you. Good luck with the spidey room. There isn't a variation on that Rosie the Riveter pose that I don't like. I remember the "Stay Strong, New York" posters that went up in the horrible days after 9/11 and how they really did lift my spirits as I stepped around that wounded city. Sorry for the sorrowful digression! Stay strong!